I am so excited to have Will, AKA Corndog, from Miranda Kenneally's second book Stealing Parker dropping in today for an interview! When you found out about Parker and Coach Brian, what was your first reaction and thoughts? I wanted to break the trophy case and throw trophies on the floor and stomp on them. I felt betrayed and confused, but I also felt like I should've known better than to get too attached to Parker when she was so confused in her own life. Jumped off a bridge into the Cumberland River. Naked. Boxer briefs. Playing sports is hard in boxers. You'll have to wait for Miranda Kenneally's third book to read about it, but it's with Parker. We sneak away to kiss in the dark at the summer camp we're working at, and it's definitely against the rules, but I don't think either of us care. Kissing Parker is so worth getting in trouble/fired. A Deinonychus. They were thought to be smart, strategic thinkers, and I spend a lot of time thinking about my friends, family, and the things around me. Thank you, Will, for dropping in, and congrats, Miranda, on the release! 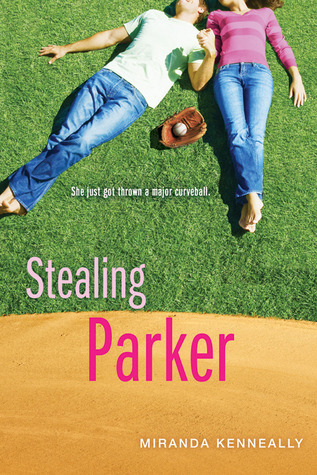 If you haven't picked up Stealing Parker yet, or Miranda's debut Catching Jordan, make sure you do! They are fast, fun, and hot reads that I totally recommend. Oh em gee. I am excited to hear about that cameo in Things I Can't Forget! Yes!